I read the other day the ceiling was made from a melted down Halifax bomber. I'd have preferred the Halifax whole as a memorial, how did this come about? When did they melt it down? 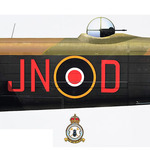 Was it disgarded parts off the one recently restored in Canada's air force museum? I was told that the aluminium used in just one small section of the roof had been melted down from a collection of scrap/odd parts in Canada and was donated by one of their associations. 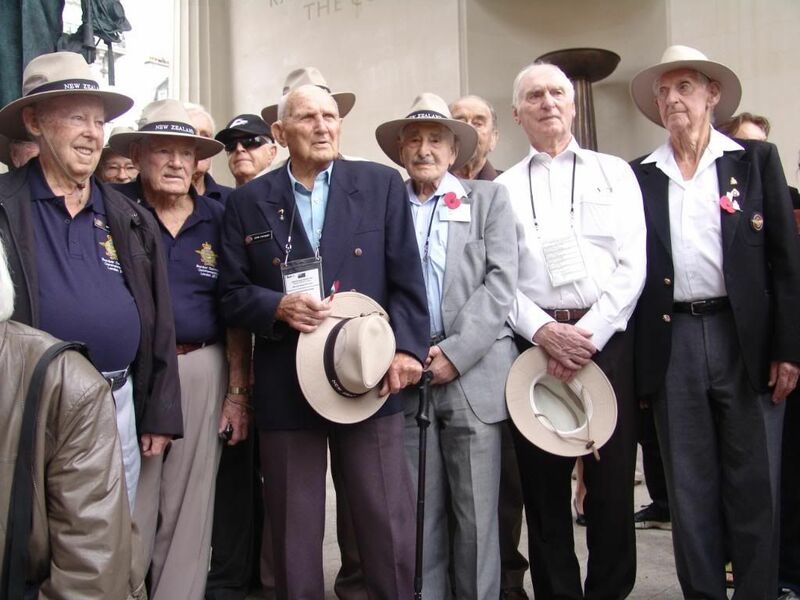 Similaly the Australians presented a plaque made from aero parts which was included in a gate. By the time we woke up to this, the design had been fixed and no more extras were allowed as the Poles, . Dutch and French wanted a go too. Yep. Bet the Gnat pilot gets a please explain for the tail strike. The F16 (is it Czeck or Slovak?) 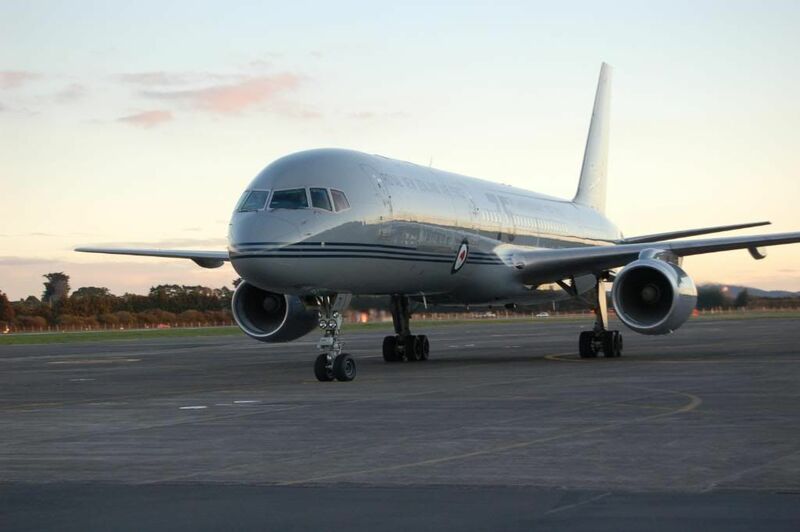 before the RNZAF B757 has a really cool paint job. On Thursday 28th The British High Commission invited a number of ex RAF Bomber Boys to a luncheon and Medal presentation to recognise UK Armed Forces Day. 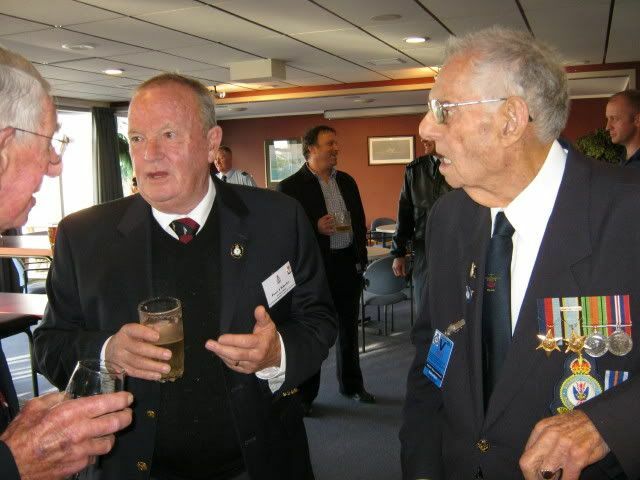 Lt Col Tim Woodman, Defence Advisor was our host. 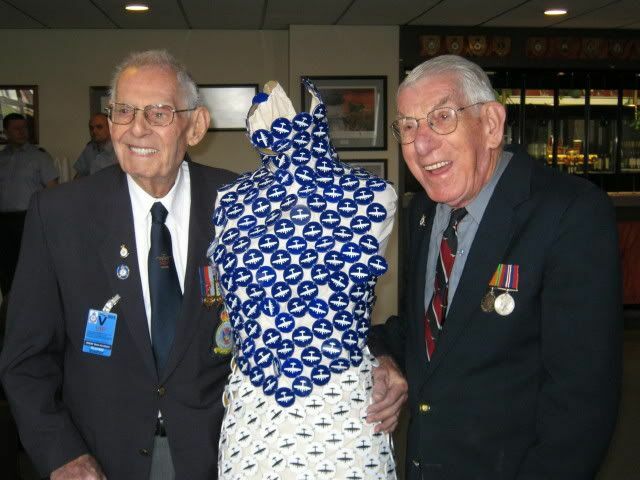 Included in the veterans list were two Airborne Division men, an SAS gent and two submariners. The converstaion was spell binding. 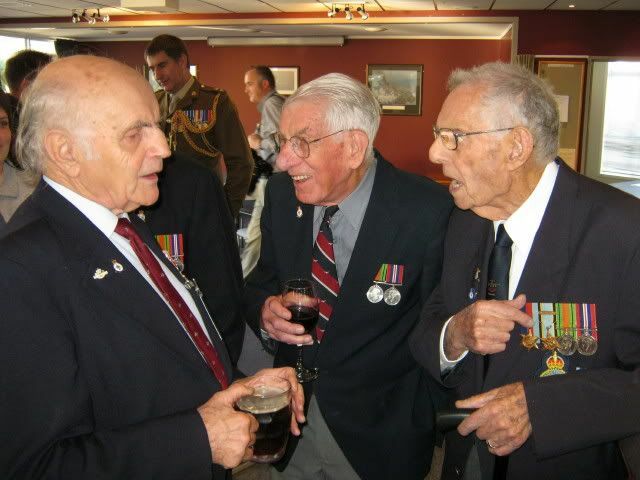 Medal Talk, Ernest Davenport, Wally Halliwell and Harry Furner comparing medals. Lt.Col Tim Woodman in the background. Can't believe they want to add a VAT tax on the Memorial! I'll happily pay the tax on the bullets needed. The UK Government seem terrified of upsetting their European partners ( read ex Axis) and of the PC brigade ( read Dresden) by contributing anything towards the memory of RAF BC. Note that the politicians were completely excluded from the order of service , an interesting message from the Royal Family and Their Armed Forces. 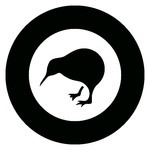 RAF BCA have noted that NZ were the first to send money for the appeal back in 2009 and the only group totally supported by their Government. Well done those men !! We are looking now to similar ceremony in Wellington during September. 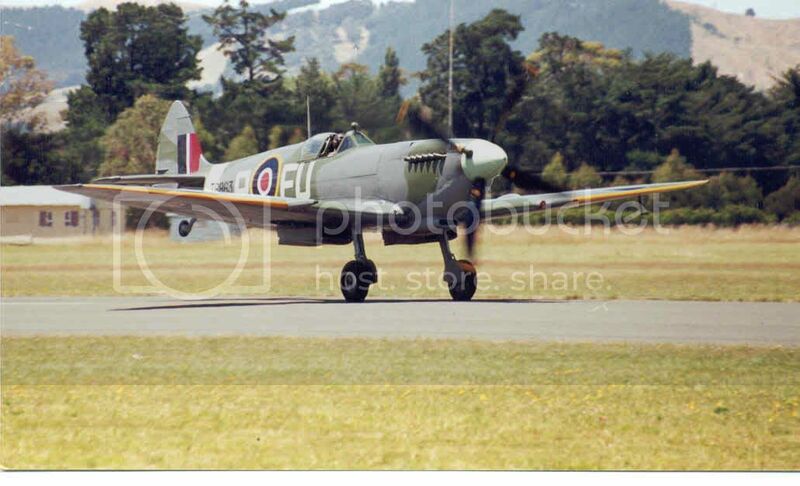 The boys arrive back at Whenuapai 1720 Friday July 6. Photos to come. Thank you for putting these photo's up Peter. Well done! For goodness sake don't make it the last weekend of September Peter!! 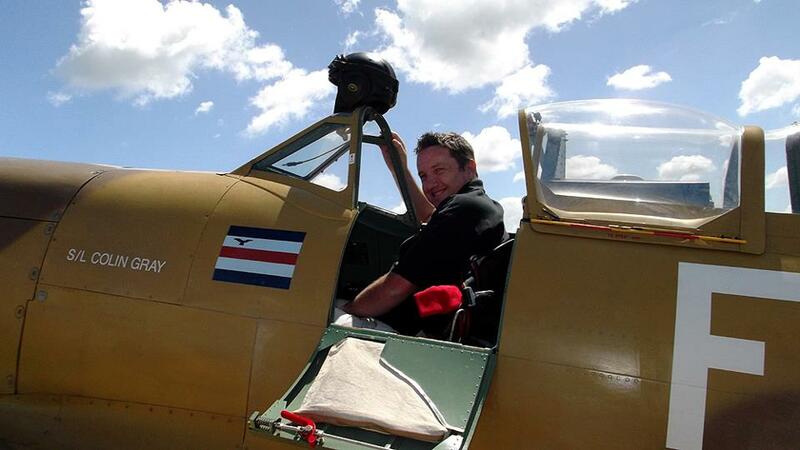 The vets won't want to miss the Mossie! Thanks Dave , but I just dont have that sort of pull, its the PMs call . My guess it will be Air Force Day , Sept 15. So we can enjoy two Sept events. The PM should be at Ardmore if he had any sense. I won't be happy if his do pulls all the veterans away from our do. 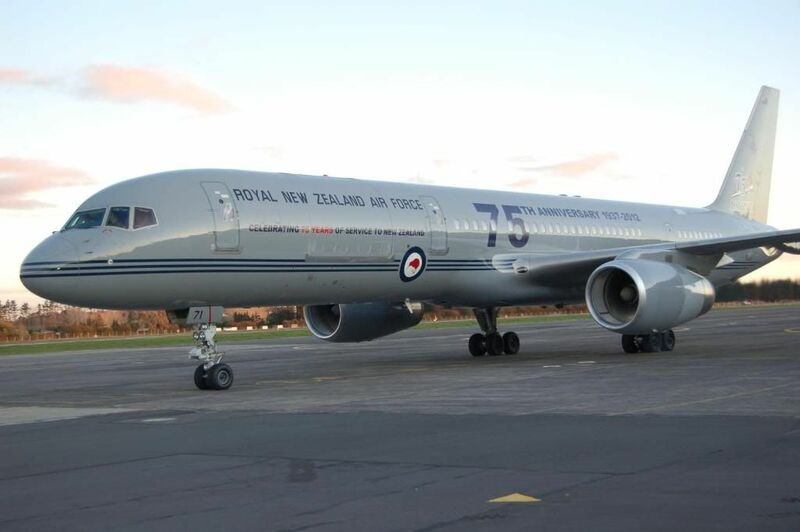 RNZAF 757 '71' landed at 1705 today with its cargo of Bomber Command Veterans. They all had a memorable time. 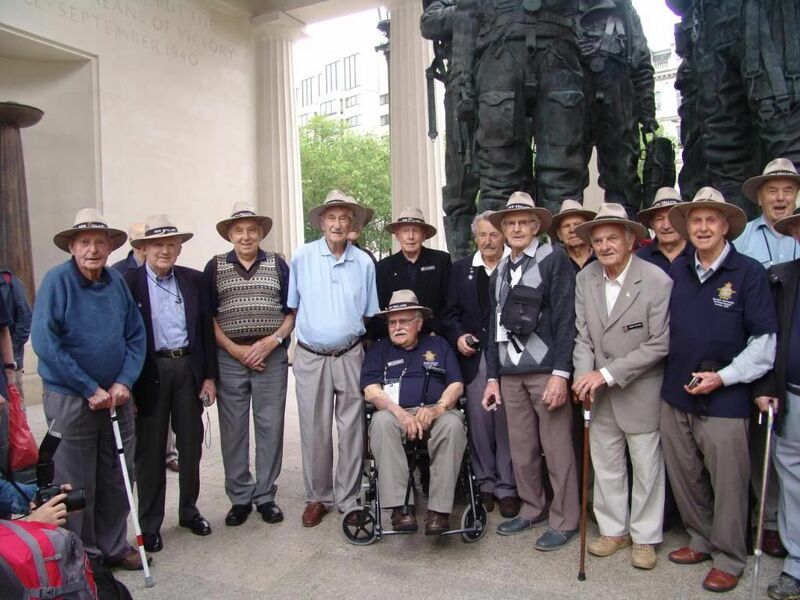 Wonderful to see them all return from their last bomber command mission. 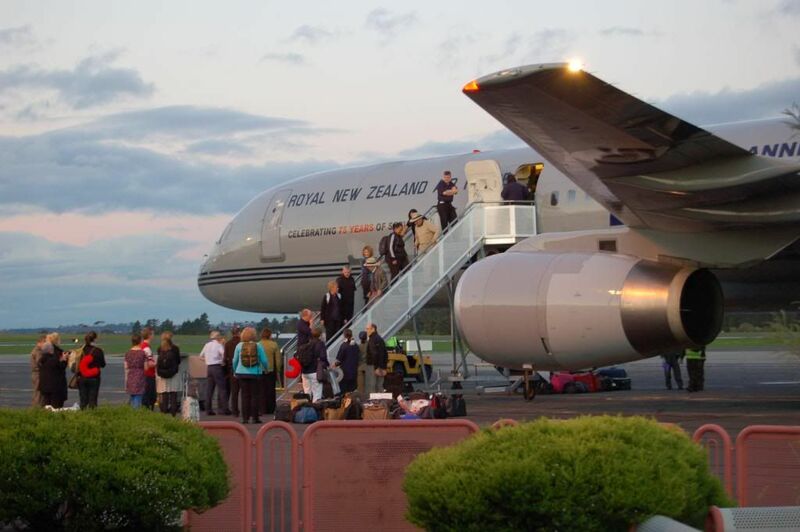 When the thirty odd RNZAF veterans flew off in June courtesy VA and RNZAF , there was some sadness about leaving all ( but one ) RAF bods behind. 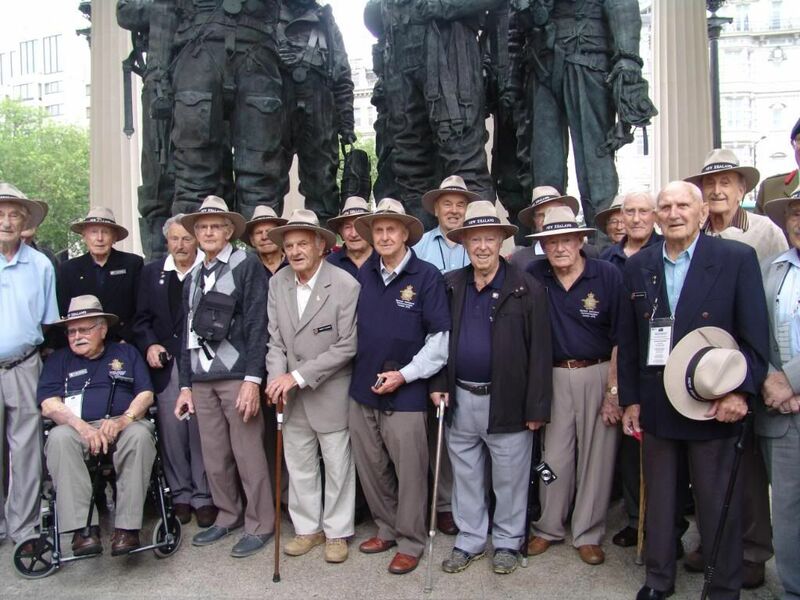 Thanks to a private sponsor from NZ Tax Management , six of these BC Veterans and partners have now been selected to join a party to go to UK in September and visit the BC Memorial, Runnymede, Hendon and East Kirkby. With the group will be a TV documentary crew lead by Rob Harley. It's bloody fantastic news Peter! Thanks for all your efforts on the vets' behalf, and the rest of the NZBCA bod's ... wonderful news. 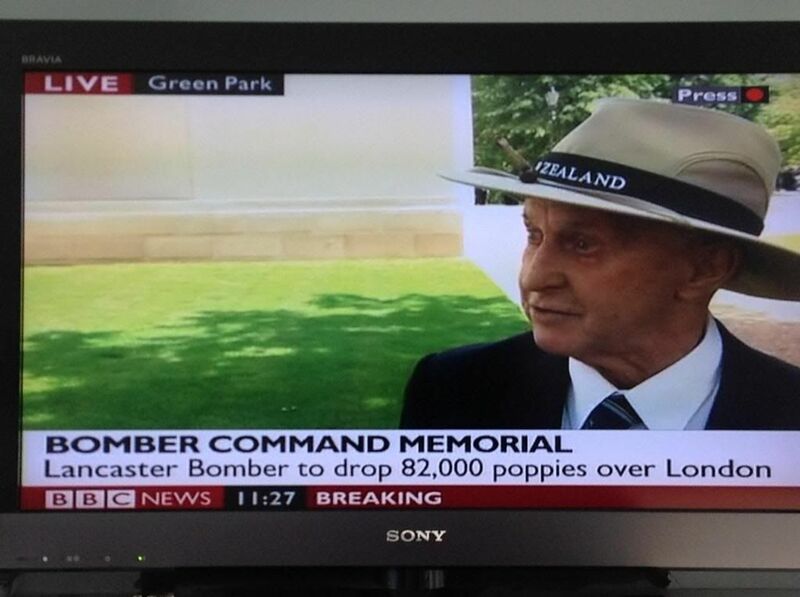 I know one ex-RAF vet at least who is very excited! Well done to all involved in this venture! !